Now our feet are standing within your gates, O Jerusalem. 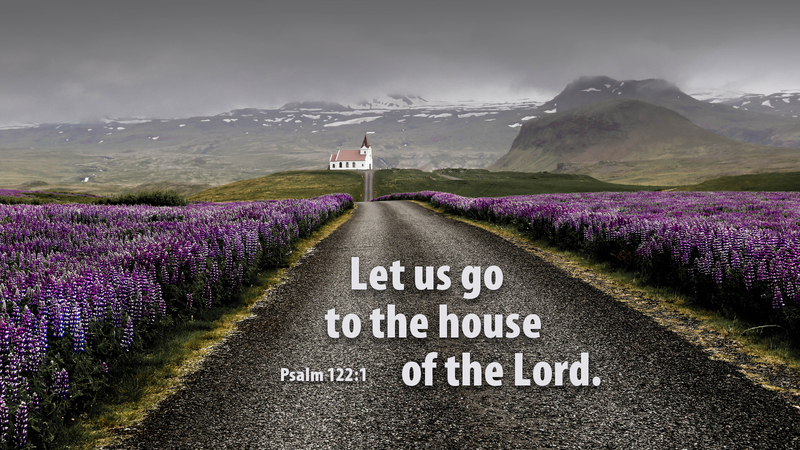 This psalm is known as a “Psalm of Ascent” or sometimes a “Pilgrim Song,” as pilgrims would sing them as they approached Jerusalem, situated high on a hill. Some believe the Jewish priests would sing these songs as they ascended the steps to the temple. In this psalm, there is a prayer for the city of Jerusalem, the place of the temple and the location of the Lord’s presence among his people. In this prayer the faithful prayed for unity and peace. Given the trials and tribulation of Israel through the ages, many Christians today continue to pray for the peace of Jerusalem. For Christians, however, this psalm/prayer focuses on the New Jerusalem, which is the Church — the Church triumphant (the heavenly city, New Jerusalem) but also the Church militant, the Church still on earth. And the Church militant is not a place or a building, although sometimes the Church inhabits buildings. Rather, the Church which is the Body of Christ exists wherever we hear the Word of God, receive the Sacraments and live our faith as disciples of Jesus Christ, baptized into his death and resurrection. The Church may be found in beautiful gothic structures, but also may be found in storefronts, meeting in school halls, gathered in homes or under a tree! The New Jerusalem may be found wherever two or three are gathered in his name! And does this New Jerusalem, the Church on earth need prayer in our day and age? Indeed! Truly! At a recent meeting of area NALC pastors in North Carolina, we were discussing difficulties and tensions within congregations. Someone mentioned that Lutherans often are not aware that our Lord provided a process for repentance, forgiveness and reconciliation in Matthew 18. We noted that, sometimes, congregations can be the most unforgiving places in all the world! Let us pray for the peace and unity of the Church on earth, and for every congregation, great and small, especially as we prepare for the coming of the Prince of peace! Prayer: Lord Jesus, help us be at peace with each other. Amen. Advent Action: Offer a prayer request this Sunday for the peace and unity of the Church and all congregations. Unity within the church must never be undermined. What a glorious thing it would be if churches could come together and be united on their commonalities and not their differences. A movement of this has started in different communities and cities. Where we live now and where I grew up are prime examples of what unity could and should look like. Pastors coming together for the good of the community in prayer for healing. Some actually do a lot of the behind the scenes work on community projects. Our hearts need to be knit together, once again on the common shared beliefs. How appropriate this lesson is in view of the current events in Jerusalem!